Modern. Comfortable. Unique. The Blake-stitched men’s shoes in our Blue Stitched collection prove you have a sense of style — but that’s not all there is to them. Classic designs met unique color accents, transforming every outfit you pair them with into a modern take on classic chic. You should definitely add these unique models to your footwear collection: You won’t regret it! A breathtaking hand finish lends a sophisticated touch to the Goodyear-welted models in our Patina Line, adorning these beloved, classic shoes with a unique visual accent. This one-of-a-kind shading is the product of a painstaking process carried out by masters of the craft. Traditional designs, stylish colour combinations, and exotic leathers await you in our collection of women’s shoes. Goodyear-welted heeled penny loafer in cognac. Dark brown Derby boot with combination closure, lambskin lining & rubber outsole. Italian Line: Trainer in anthracite nubuck with closed 6-eyelet lacing. Italian Line: Loafer in black glazed calf with broguing. Classic heeled cap-toe Oxford in black with closed 5-eyelet lacing. Goodyear-welted deerskin Oxford in white with closed 5-eyelet lacing. Goodyear-welted penny loafer in dark brown. Classic Chelsea boot in black with elastic side inserts and pull tab. Classic cap-toe Derby in black with open 5-eyelet lacing. Ribbed, bicoloured knee socks made of pure mercerised cotton in 11 colours. Classic cap-toe Oxford in green with closed 5-eyelet lacing. Classic slingback pumps in black calfskin with a stiletto heel. Italian Line: High-top trainers in dark grey velours and fabric with open 8-eyelet lacing. Modern ankle boot in black-brown soft calf leather with zipper and Vibram sole. Italian Line: Trainers in brown Italian calfskin with open 7-eyelet lacing. Classic Chelsea boot in black French calf and velours with elastic inserts and Vibram sole. Modern Chelsea boot in brandy soft calf leather with elastic inserts and Vibram sole. Modern Wholecut in nut-brown with rosette and closed 5-eyelet lacing. Classic Chelsea boot in black French calf with elastic inserts, pull loop and Vibram sole. Italian Line: High-top trainers in dark brown Italian calfskin with open 9-eyelet lacing. Classic Chelsea boot in navy velours with elastic inserts, pull loop and Vibram sole. Classic Oxford in nut-brown and dark brown with rosette and closed 5-eyelet lacing. Modern Chelsea boot in nut-brown soft calf leather with elastic inserts and Vibram sole. Italian Line: High-top trainers in blue nubuck with open 9-eyelet lacing. Classic cap-toe Derby in nut-brown with open 4-eyelet lacing. Italian Line: Trainers in dark red Italian calfskin with closed 7-eyelet lacing. Modern ankle boot in brandy soft calf leather with zipper and Vibram sole. Beloved, classic models with thrilling colours and dynamic cuts: Our extravagant men’s shoes are the perfect footwear for very special moments. Our classic men’s shoes exude pure elegance. From elaborately decorated to plain and sleek, stylishly napped to smooth and supple, our collection includes all kinds of Oxfords, Derby shoes, and monk shoes. Sophisticated heeled and classic models, light loafers, stylish boots and ankle boots—our collection leaves nothing to be desired. Shoe cleaning kits are clever solutions for fans of well-kept shoes. There is an overwhelming array of shoe care products available on the market. Save time and energy by reaching for a shoe cleaning kit. Leather requires nutrients—shoe polish supplies them. Premium shoe cream also removes soiling from the surface of your shoes, protects shoe leather, and leaves behind a coveted, glossy shine after polishing. Maintain the shape of your shoes. Made from either beech or cedar, our shoe trees smooth out creases from wear in shoe uppers and help shoes dry more quickly. Our stitched full-leather belts for men are made from the same kinds of leather as our stunning Goodyear-welted shoes—premium calfskin, velvety velours, and exotic varieties. These gorgeous accessories embody quality, elegance, and style. Witness the quality of our collection, up close and in person. Live out your passion for shoes at our brick-and-mortar retail locations in Berlin, Hamburg, Frankfurt, Dusseldorf, Munich, Cologne, Zurich, and Warsaw. Our professional in-store advisors look forward to greeting you! A t SHOEPASSION.com, we are committed to illuminating the advantages of Goodyear-welted footwear, as well as to offering our own collection of truly dreamy shoes at attractive prices, using an effective chain of distribution. In doing so, we focus upon expert knowledge, quality, extraordinary service, and full transparency. Goodyear-welted leather shoes are made using the supreme shoe production method. Learn what makes these premium shoes so special. Take a look inside our factories in Spain and Italy. Learn all there is to know about the meticulous production process that goes into our shoes. Welcome to our online shop SHOEPASSION.com! SHOEPASSION.com – passion for men’s shoes. 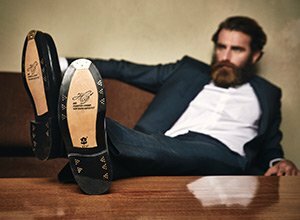 Find all you need to appreciate Goodyear-welted men’s shoes in one place. Sample our broad shoe knowledge, our own high quality collection, news about men’s shoes and fashion, care accessories and helpful advice for perfect shoe care. Good taste is undergoing a renaissance and SHOEPASSION.com wants to play its part in championing high quality products for all. Over the years, men’s shoes have drifted ever-lower in quality whilst one of the oldest traditional crafts has withered on the vine. For many men, buying shoes has become a frustrating compromise and a chore they undertake with little relish. Sadly, too many men will never feel the beauty and joy of handcrafted, Goodyear-welted shoes. But we want to change that. Goodyear-welted men’s shoes, made of high quality leather and crafted with attention to detail, look fantastic. Each shoe produced this way aims to fulfil the highest quality standards. Welted shoes allow the foot to flex perfectly in its most naturally way and are a great way to promote good foot health. The leather does not only look great, but guarantees breathability. Contrary to shoes constructed with adhesive, Goodyear-welted footwear also promises durability. If properly cared for, your shoes can look great year after year and sometimes even for decades. We are committed to sparking men’s interest in Goodyear-welted footwear, the almost forgotten, supreme discipline of shoe manufacturing.. It is our goal to create men’s shoes in our own brand, which are sophisticated in design and quality, and which fulfil the growing enthusiasm for men’s fashion and style. Whether a formal shoe, an extravagant style, boots, loafers, moccasins or sneakers – we offer the right Goodyear-welted shoe for any occasion. Properly cared-for footwear is an essential calling card for any man. We offer a wide range of exquisite products for the care of leather shoes from Burgol, Solitaire, Saicara, nico, Abbeyhorn, Swims and Morello – all guaranteed to produce optimal results. From shoe cream, several shoe brushes, wood shoetrees and shoehorns through to shoe clean sets, shoe care sets and shoe shine boxes, we have all the necessary items available in our shop to conserve and clean your Goodyear-welted shoes. Of course, it is not only important to regularly care for your shoes, but also not to lose sight of your own foot health. Good foot care can make an indispensable contribution to wellness and comfort. Both sock liners and shoe inserts can increase the individual sense of wellbeing in case of orthopaedic problems. We also stock helpful extras such as our shoebox for perfect shoe storage, galoshes to protect your shoes against wet and mud on your trip from your home to office, a full automatic shoe-cleaning machine and of course shoelaces, too. All in all, our shoe care section offers 111 products in 13 categories dedicated to perfect footwear upkeep. With more than 80 articles, arranged in 12 categories, as well as hundreds of pictures and illustrations, SHOEPASSION.com offers a compendium of knowledge about extraordinary men’s shoes. Beginning with classic footwear like Oxfords, Derbies or Budapesters, explanations of shoe manufacture and leather production, through to articles on correct shoe care, you will find all our shoe knowledge collected in one place. SHOEPASSION.com looks back into the history of shoes and explains the evolution of shoes from the early days to the present. Find answers to questions like: “What shoe matches with which outfit?” or “When is the ideal occasion for Brogues?” All in all, SHOEPASSION.com is one of the biggest compendiums of shoe knowledge online. Men’s shoes are more than simple everyday objects. Earlier generations appreciated this traditional craft, but today it has been scandalously neglected. SHOEPASSION.com though provides an insight into the extraordinary world of Goodyear-welted shoes. Allow us to show you the best in footwear artistry.